Photo: Scala.com, invitation to investigate the breadth and depth of Scala's global digital signage. The national security report sponsored by SCALA.com, digital par excellence. Every Friday, the Scala Report. Scala utilizes the latest in digital signage technologies to create powerful, visually engaging customer experiences for businesses and retailers. Our digital signage solutions work seamlessly with current and cutting-edge technology such as touchscreen kiosks, assistive selling tools, mobile integration and more, allowing marketers to tailor on-screen messaging in real time. With more than 30 years of experience and in-house experts who create engaging digital display solutions, Scala creates interactive, personalized experiences helping you stand out and get your voice heard. Earlier this year, the US Department of Defense claimed that the Taliban has not had the initiative, but instead it has launched attacks on soft targets out of desperation. However the Taliban’s operations throughout the country has disproved the Pentagon’s narrative. Afghan security forces are taking casualties at a record pace, and Taliban controlled and contested districts are at an all-time high. Former Egyptian officer turned al Qaeda loyalist reportedly captured in Libya It was al Qaeda that cleaned ISIS out of Libya. https://www.longwarjournal.org/archives/2018/10/former-egyptian-officer-turned-al-qaeda-loyalist-reportedly-captured-in-libya.php The Libyan National Army (LNA) claims to have captured Hisham al-Ashmawy, a former Egyptian officer who defected to the jihadists’ cause. Ashmawy has long been hunted by Egyptian and Libyan forces, as he has been accused of leading jihadist operations in both countries. 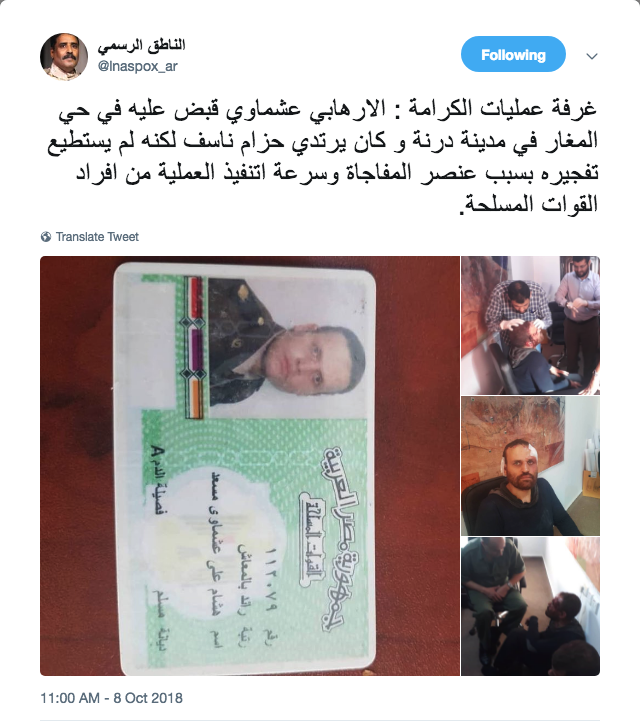 A released photos of a bloodied Ashmawy (one of which can be seen on the right), as well as an image purportedly depicting his Egyptian military identification card (seen below). Earlier this year, the LNA launched an offensive in Derna and has reportedly killed or captured various jihadi figures since then. Ashmawy has been targeted by both the LNA and the Islamic State. In Aug. 2015, the Islamic State’s supporters named Ashmawy as one of the jihadists they “wanted dead.” Ashmawy resisted the call of the so-called caliphate and opposed the expansion of . . .
Monday 8 October 2018 / Hour 1, Block B: Tom Joscelyn, Long War Journal and FDD; and Bill Roggio, Long War Journal and FDD; in re: US strikes Shabaab on southern Somalia coast https://www.longwarjournal.org The United States has conducted 24 strikes in Somalia in 2018, all of which have targeted Shabaab. The strike occurred near a town that was liberated by Somali forces just two days ago. Monday 8 October 2018 / Hour 1, Block C: Gordon Chang, Daily Beast, in re: Big problems n big China. Pompeo suddenly left Pyongyang and flew to Beijing; Pompeo was straightforward and said, “We have fundamental disagreements with China.” Important that he show that we’re not afraid of being clear, and are willing to assert our rights and those of the intl community. A very good move. For decades, Washington has set the success of the Chinese Communist Party as a US goal! . . . We’re suspicious when the head of Interpol returns to China in September and disappears. Beijing says that he resigned and is being investigated. Disagreements at the top of the CCP are so severe that they're breaking out n public. Xi has Mao-era power and, along with them, Mao-era instability. Pompeo regrets that the planned mid-October meeting among US and Chinese diplomats, the “security dialogue.” We cancelled because China with drew their top admiral, thereby cutting of mil-to-mil dialogue, Shows that Beijing is having a temper tantrum. A million Uyghurs locked in concentration camps; China is trying to liquidate an ethnic group, incl by torture and murder. Taiwan. No mil-to-mil. Coming: a weekend discussion among Pyongyang, Moscow, Beijing. As US-Chinese relations fade, where does that leave Moon Jae-in’s utopianism? Need to tighten US sanctions on [illegal] activities by China. Disagreeable for a while but safer than the alternative. Moon works for Pyongyang! He’s subverting his own society, his own nation. Kim drove a new Rolls to meet Pompeo to flaunt the fact that US sanctions aren't working at all. Monday 8 October 2018 / Hour 1, Block D: Fraser Howie, author, Red Capitalism: The Fragile Financial Foundations of China's Extraordinary Rise; writes for SCMP, Lowy Institute, et al. ; in re: The game of chicken last week with the Decatur. Has Xi Jinping ceded control of the face of China controlling the world? In some ways, acting predictably; in the case of the Interpol chief, you couldn’t make that up for a novel. Chinese have had it their way for a long time and aren't getting their way any more, and are acting rattled. Their economy has been slowing for a long time; they'll have a Lehmann moment. Stress in the economy; have grown addicted to credit. Bloomberg article last week about the big hack, that goes right to the heart of Chinese manufacturing. Struggling, or should be, to find a new model – but they’re so used to running rings around others, esp the US, they’re fighting back in the ways that they do. The very mention of the notion of Hong Kong independence gets Beijing rattled, you have completely intemperate behavior. Monday 8 October 2018 / Hour 2, Block A: David M Drucker, Washington Examiner, & John Fund, NRO, in re: David just returned from Tennessee; the Kavanaugh matter – what the GOP learned from all this was that it was a good exercise for them as it galvanized the Republican vote and awakened interest in the midterm elections. That all really angered a lot of Republicans. Including those who weren’t very enthusiastic about Trump. The DC mess created a straight ticket for the GOP. Democrats overall would have been in better shape had they not had this. Learned by the Democratic party: strategy was either to get Kavanaugh off the Court, or else rev up troops through righteous anger; but results are mixed. Instead, Republicans are all revved up and we have a campaign on our hands. Kavanaugh situation led us to a British-style journalism [heavily oppositional]; a clarifying moment. Monday 8 October 2018 / Hour 2, Block B: John Fund, NRO, & David M Drucker, Washington Examiner, in re: What used to count a lot: The economy. And what happened to Russiagate? . . . Democratic officials don't want to talk about impeaching Trump, but the base can't help it. Monday 8 October 2018 / Hour 2, Block C: Malcolm Hoenlein, Conference of Presidents, in re: Barkan Industrial Zone: two people murdered by a co-worker, who fled. There are 3,300 Palestinians and 3,300 Israelis work together harmoniously with exactly the same pay, Guy come in and sho a young mother and a young father. Caught everyone off guard; the tragedy alarmed everyone – esp the brutality, as the killer tied them up and executed them. Abbas continues with horrific threats – against both Palestinians in Gaza, and against Israelis, where he incites rioting and never condemns any violence. Zarif (Iran) meets Lavrov (Russia). Iran accuses Russia of collaborating with Saudi Arabia to lower the price of oil. Note that Volvo, Der Bild, others . . . Total (France) said it couldn’t afford to collaborate against anti-Iran sanctions; similarly, Eni (Italy). Bolton spoke today in forceful terms about Iran as the world’s leading sponsor or terrorism. EU’s failure to press IAEA to go after obvious evidence of Iran’s nuclear program, or condemn Hamas’s extraordinary violence in sending fire kites and rockets across the Gazan border to kill and wound and damage civilians. Area C: road from Jerusalem to the Dead Sea; no one living n either side . . . Khan al Almar [? ], a tiny and illegal encampment of illegal structures on the side of the four-lane highway. For decades, Israel has resisted turning this into a Palestinian space because it's a strategic location. Israel is resettling the inhabitants — Bedouin — and the EU is calling it . . .
Monday 8 October 2018 / Hour 2, Block D: Malcolm Hoenlein, Conference of Presidents, in re: . . .
Indiana Hoenlein: The world’s oldest brewery: a cave north of Haifa, served as a burial site for Natufian people (lived after Paleolithic), who fermented different kinds of grain, some possibly used in burial ceremonies. A souplike liquid, different from today’s; was a variety of beer. Israel antiquities Authority tomorrow will announce something enormous; we don't yet know what it is. Also, seals with a king’s and prophet’s name; could have been an amazing connection. The lost theater under the Western Wall, Wilson’s Arch, Second Temple period: a Roman-period 200-seat amphitheater. We don't know what else we’ll find there; but this is a remarkable discovery. – Indiana’s swift change from street clothes into exploration cape; remember the toads, the beheaded frogs?